Do You Exercise Your Content Marketing Muscles Regularly? Are your content marketing skills in shape? Before you answer, realize this is back-to-school and post-vacation season. It’s when people get back to work and gym routines. Even if you’re an experienced marketer, your content proficiency may be a bit out of practice after the summer. Or you may be looking to enhance your skills. 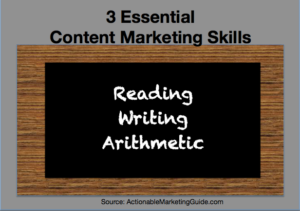 Content marketing requires basic proficiency in 3 key areas: reading, writing and arithmetic. You exercise regularly to keep your body in shape. So, why wouldn’t keep your professional abilities at their peak? Especially given the dynamic nature of content marketing. You’d be surprised how many marketers (entrepreneurs and other executives for that matter) don’t continually keep these muscles in top form. My mother always said, “Use it or lose it!” She meant both your body and your mind. Just doing your job isn’t enough. You have to know about and be able to apply the latest methods and approaches to your content marketing. 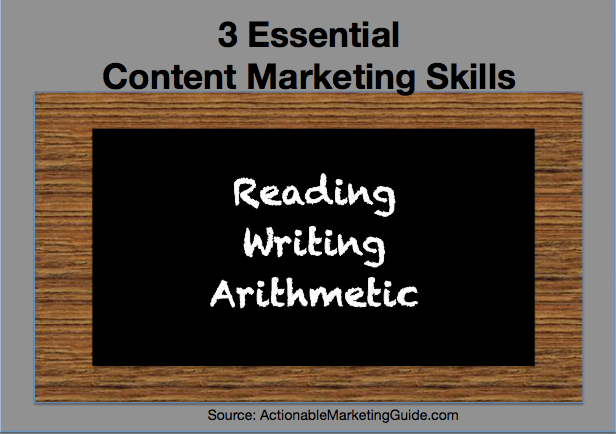 The 3 essential content marketing skills are reading, writing and arithmetic. While future research may show the power of technology-based tools, these skills rely on your brain. Read to broaden your horizons and improve your writing and communications. Authors regularly talk about how much they read. It feeds your mind and puts you in someone else’s shoes. This helps content creators to write content from their customers’ perspective. Build your reading muscles. Don’t curb your choices. Reading helps you to internalize the author’s writing style to improve yours. Ask’s Ryan Levesque learned copywriting by physically writing every word of a master’s letter collection. Social Triggers’s Derek Halpern reads voraciously. It’s how he discovered that Johnson & Johnson created the first content marketing. During the Civil War, the company published a handbook for field medics. Ryan Holiday tracks his reading with physical note cards, called marginalia. It’s helps you track quotes and information you want to remember. Some people, notably Michael Hyatt, uses Evernote to handle this function. Even President Obama finds time to read. In fact the White House shared his summer reading list. It’s a broad variety of books. Even better, Obama supports local bookstores! If the arguably busiest man in the world finds time to focus on reading, shouldn’t you test this habit? read to calm down before sleep. Content marketers must be able to communicate using different formats and media. I wanted to write since I was 8. But teachers and their old fashioned methods made me hate it. Writing well takes work. You have to show up at the page on a regular basis. I believe that writing is a habit. More importantly, I’ve started to let my drafts breathe. It’s amazing what a fresh perspective and a cup of joe can do. Many content marketers choose the profession since they believe that it’s not numbers. I should know. I taught graduate level Marketing Finance at NYU. (Hat tip to my former students!) As I told my students, the person who understands the numbers, owns their budget. My course got more than one of my students promoted! Here’s the kicker. Most people do math. They just don’t think of it as arithmetic. I’m pretty sure you know how much change you should get when you use cash. Math is a basic skill. If you don’t like or believe you’re not good at it, chances are someone told you that you couldn’t do it when you were young. It’s only adding, subtracting, multiplying and dividing. It’s that simple. There’s probably a ton of free options online. Give yourself positive reinforcement. (No laughing!) Tell yourself that you can do math. If necessary put post-its in places you’ll see them everyday. 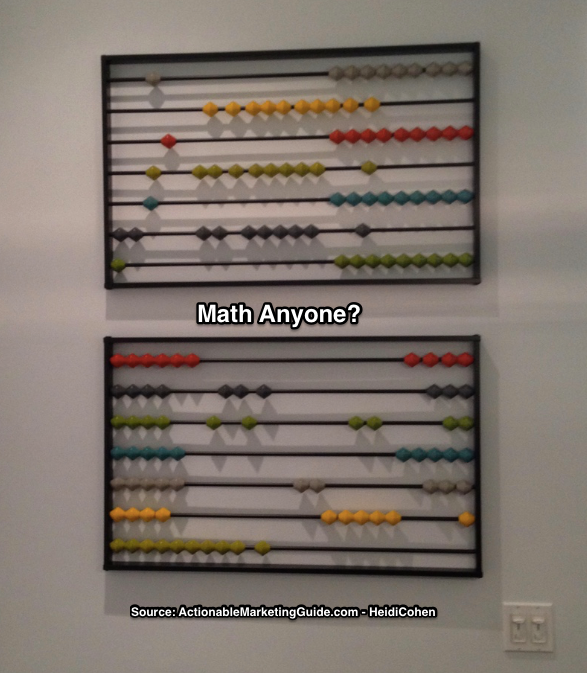 Practice your math skills everyday. If you’re buying a few things, add the costs in your head. Round the numbers for ease. Once, my grandfather followed my mom around a supermarket adding every item as she put it into the cart. He told the checkout clerk the exact amount to the penny including tax! Manually check your spreadsheets. Don’t assume formulas are correct. My staff would get upset when they showed me a spreadsheet they toiled over and I spotted errors at a glance. I could tell they were different from the rest in the column or row. You can too! Spot check calculations. Just as you have the power to get back into your exercise routine, you can improve your content marketing skills, namely reading, writing and arithmetic. Unlike exercise, you don’t need to leave your office or your home. Even better, you can use otherwise “wasted time” such as commuting or even exercising. Make your content marketing skills practice part of your daily routine. Put a book in your workbag. Paste a post-it to your mirror. 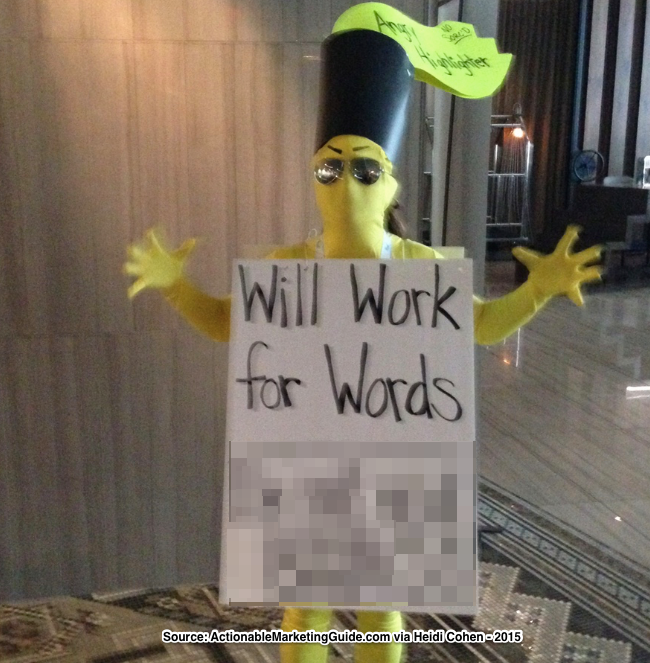 Photo Credit: Heidi Cohen – Permission to use if you link to this article. Tags Ann Handley, Derek Halpern, Julie Cameron, Michael Hyatt, Obama, Pocket, Ryan Holiday, Ryan Levesque, Tim Sanders. Bookmark the permalink. Great post and it is really worth to read it. I like how you provide options that anyone can implement. Passing this on to friends for sure. I am going to bookmark this blog and waiting for the next blog post.